The day before Martin Luther King Jr.’s birthday, tenant activists sat in the gallery of the New York State Senate as a slew of important voting and campaign finance reforms finally passed the legislature. These included early voting, pre-registration for 16 and 17-year-olds, consolidating state and federal primary elections into one date, facilitating voters’ registration transfers when they move, same-day voter registration, giving every voter the right to an absentee ballot, and closing the LLC loophole that has allowed big landlords and other corporate interests to pour unlimited amounts of money into our elections. When the Senate closed the LLC loophole, applause erupted from the tenants sitting in the ornate gallery above. Same day voter registration and the absentee ballot reform will require amendments to the state Constitution. Republican Senator Catharine Young launched a series of anti-democratic attacks against the early voting bill, which Democratic Sen. Zellnor Myrie defended admirably in his first debate on the floor. Young questioned “how many more voters” this “enormous unfunded mandate” would turn out, feigning concern for “overburdened taxpayers” who are “crying for relief” and “fleeing” the state on account of heavy property taxes, as if the State of New York were the King of England. The Gender Expression Non-Discrimination Act (GENDA), which protects transgender and gender non-conforming people from hate crimes and discrimination in employment, housing, public services, and other areas, was also passed the next day, as well as a ban on so-called “conversion therapy.” In introducing the bill, Democratic Sen. Hoylman reminded his fellow lawmakers that transgender people had been excluded for 17 years from the protections of the Sexual Orientation Non-Discrimination Act, passed in 2002. These bills also passed the NYS Assembly easily, and, ten days later, the right-leaning, progressive-posturing Gov. Andrew Cuomo had no choice but to sign them into law. The electoral and civil rights reforms were the first bills passed by the new legislature, freshly released from the ball and chain of the Independent Democratic Conference (IDC). The ousted IDC had been elected as Democrats but were caucusing with Republicans, blocking these and other bills from coming to the floor for a vote, while publicly claiming to support them. The new chairwoman of the ethics committee, Sen. Alessandra Biaggi, expressed how “incredibly excited [I am] to fight for every single thing on this list. One of the things that I would love to see added that I’m going to fight for,” she said, “is making sure that we have a sexual harassment-free Albany.” Biaggi’s labor-backed primary campaign took down the former IDC leader Jeff Klein, a heavily real-estate backed senator who had managed to get his own sexual abuse charges swept under the rug. One week ago, the new legislature passed the NYS DREAM Act, the Reproductive Health Care Act, the Comprehensive Contraception Coverage Act, and a bill ending “the mandatory use of state assessments to determine a teacher or principal’s effectiveness,” giving more power to local school districts and teachers. Tenants demanding the right to housing had a large role to play in removing the IDC from power and setting the stage for a more advanced political fight. 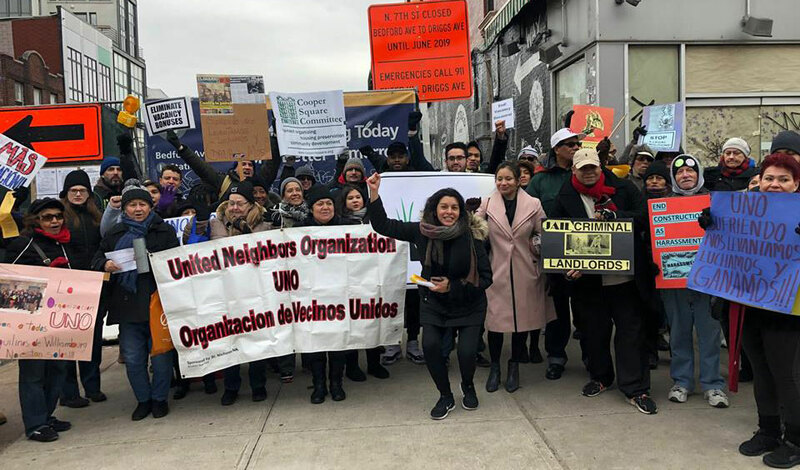 For a year prior to the primary elections, members of the Real Rent Reform Campaign knocked on doors in IDC members’ districts, talking to their neighbors about needed reforms to New York’s rent laws, and what their elected officials were up to. The Dream Act, the reproductive rights bill codifying Roe v. Wade in New York, election reform, and housing bills are driven by New Yorkers seeking protection and an alternative to Trump’s federal cuts and attacks on women, immigrants, LGBTQ people, and working people. The fight against the IDC was also a fight against the pro-Trump Republicans that the IDC enabled, and was energized by the fight against Trump.